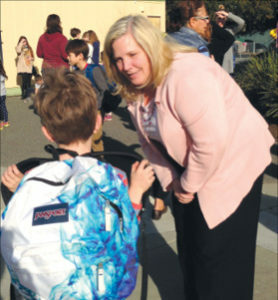 Cynthia Brictson, new Bullis Charter School principal, greets a student at the start of school earlier this month. Bullis Charter School recently hired Cynthia Brictson as its new principal/director of instructional services. She replaces Jocelyn Lee, who resigned to become director of the Oshman Family JCC Leslie Family Preschool, which her children attend. Brictson comes to Los Altos from Atlanta, where she served as deputy superintendent of curriculum and instruction and regional superintendent for DeKalb County Schools. Brictson has been entrenched in many aspects of public education, including staff development, technology integration and implementation of STEAM and data-driven approaches to student learning. During her time in Georgia, she supported the STEM certification of nine public schools. She is an Apple Innovative Educator, serves on the board of advisers for the STEM World School in India and is a member of the Chief Academic Advisory Council for the Center for Digital Education. Prior to joining Bullis Charter School, Brictson served as assistant superintendent of curriculum and instruction in Georgia, as director of teaching and learning for West Metro Education School District in Minnesota, as coordinator of curriculum and instruction and graduation standards staff development for K-12 in the St. Louis Park School District in Minnesota and as principal at Smith Elementary School, recognized as a Title I Distinguished School three years in a row. Brictson said she is “deeply passionate” about project-based learning and “excited” to work alongside students as they solve real-world problems and gain the tools they need to be successful. She is getting to know the students, parents and staff and will be a regular presence at both the north and south Bullis Charter School campuses.